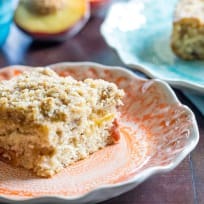 Peach coffee cake is a summery breakfast treat. It's a great way to use up less-than-perfect peaches you might have lingering in your fridge. 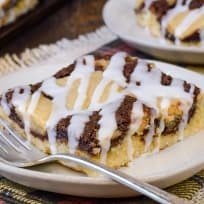 This chocolate peanut butter coffee cake is just loaded with peanut flavor. Have it for dessert or breakfast — you decide! This Blueberry Pecan Coffee Cake is sweet and nutty. It’s a great way to kick off Saturday morning brunch! 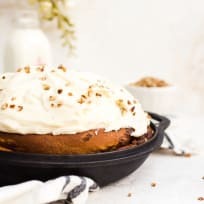 Pumpkin Snickerdoodle Snack Cake is perfectly snackable! Pair this moist, spicy cake with a cup of coffee or tea for the perfect Fall afternoon treat. 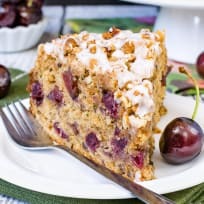 Cranberry streusel coffee cake is warm, tangy, and just the best thing ever on a cold winter morning. Don't skip the streusel topping!